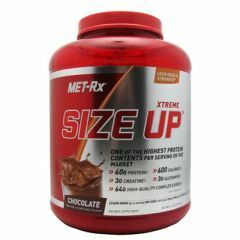 AllegroMedical.com presents The MET-Rx Size Up - Chocolate Weight Gain Supplement. MET-Rx Xtreme size up has one of the highest protein contents per serving on the market. Providing 60g of protein and 600 calories per 4 scoop serving, xtreme size up should be your only choice for serious mass gaining! If you are one of those people who have a tough time packing on solid, powerful mass, try met-rx xtreme size up, specially designed for hard gainers who want to gain weight and pack on mass. MET-Rx xtreme size up features four optimizer blends to help you keep growing! Our specially selected nutrients are designed to meet your body's needs for both immediate and sustained energy and protein synthesis. The Secret is the Source of Protein! METAMYOSYN Muscle Mass Optimizer Blend combines the trusted METAMYOSYN protein blend, with extra Whey Protein and Creatine, to provide sustained, highly bioavailable fuel for your body's protein needs. A combination of fast and slow proteins results in a more prolonged absorption rate allowing extended muscle-amino delivery. By extending the delivery of all essential amino acids to your muscles, MET-Rx Xtreme Size Up helps to stop you from going into a catabolic state which can otherwise lead to muscle loss. MET-Rx METAMYOSYN Muscle Mass Optimizer Blend utilizes complete proteins from the finest sources to ensure every amino acid required by your muscles is supplied. Energizing Carb Optimizer Blend contains high fiber and glycogen-building carbs that work hand-in-hand with the Muscle Mass Optimizer Blend. This specialized blend contains over 70g of carbs per serving to keep your muscles fully loaded with this important macronutrient. MET-Rx Xtreme Size Up is formulated with no fructose, so you won't experience the dreaded crash and burn that comes from consuming sugar-laden formulas. Keep your mind energized with carbs so you can keep training and growing! Lean Lipid Optimizer Blend contains just the right amount of dietary fats per serving. We know that your goal in your workout is to pack inches onto your biceps rather than your waist, so we didn't compromise quality with loads of unhealthy fats that could slow down your progress. MET-Rx Xtreme Size Up contains both quick digesting MCTs and slower digesting flaxseed and sunflower fats, which allows for energy availability over an extended time period. MultiVitamin Optimizer Blend is packed with specially selected vitamins and minerals essential to carbohydrate and protein metabolism. Optimal intake of key vitamins and minerals is especially important when following a high-calorie diet and exercise program for mass gains, in order to assume proper usage and muscle metabolism of ingested calories. You can rest assured that our comprehensive blend of the right vitamins and minerals will complement your nutrition plan to support your bodybuilding goals and optimal health. In order to make serious gains, you need to train hard, get lots of rest, and take in plenty of key nutrients. MET-Rx Xtreme Size Up makes it easy to get the high quality protein, energizing carbs and essential nutrients that are important to a serious, intensive training program.